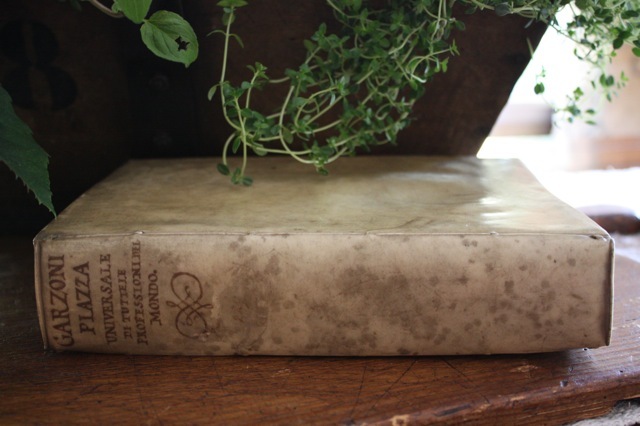 Willow Decor: Antique Vellum Books & Our Most Exciting GIVEAWAY Ever!!! Antique Vellum Books & Our Most Exciting GIVEAWAY Ever!!! Antique Vellum Books have been used as gorgeous accents in extraordinary rooms for years. Vellum is a fine parchment made from the skin of a lamb, pig or calf. Primarily it was used in the 15th and 16th century to bind books. The skins were stretched over boarding in a way very similar to leather. The luminosity, texture and beauty of Antique Vellum has made it a favorite of designers. Of course Vellum books have always been popular with the wonderful Furniture and Interior Designer Rose Tarlow of Melrose House. 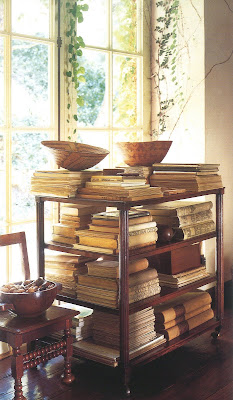 Here in a photo from Architectural Digest in 1991 you can see her love of these precious books. Here is another angle of the same room. Notice the bookcase filled with Vellum books. A shot of Tarlow's bedroom, notice the stacks of vellum books. Read a wonderful post about Rose Tarlow and her design aesthetic by Joni Webb of Cote de Texas here. Above is a beautiful room from Antique Dealer and Design enthusiast Kay O'Toole. Notice the stacks of antique vellum books on her table. Cote de Texas once again did a wonderful post about O'Toole and her home read more about here. So imagine my delight when Kym Fraser of 3 Fine Grains contacted me about her new venture into the world of Antique Vellum Books. Apparently, several months before a famous actor had contacted her. He was impressed with her love and knowledge of antiques coupled with her wonderful designer background. An avid antique collector and design enthusiast himself, he had become the largest collector of Antique Vellum books in the United States. 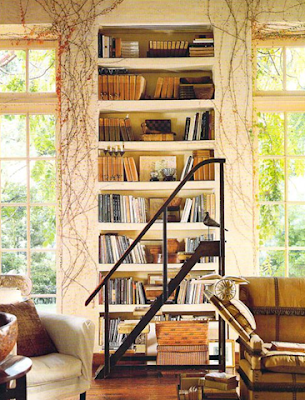 He had designed an exquisite room in his Malibu beach house and filled it with over 800 books. But, unfortunately he was moving and would she be interested in connecting the right designers and antique lovers with these wonderful books for him? It was important to him, that the new owners appreciate the beauty of these rare treasures. Kym Fraser currently has over 600 of these gorgeous books. They range in age from 1572 - (yes, that is not a typo -books from the 1500's) to the late 1800's. Most books are in written in Italian, French, and Latin, and even some in Hebrew. The books are varied and all are vellum. Some have ribbed bindings and some flat. Some are embossed in gold and some also have colored leather. Some have marbleized covers and hand painted pages. They are a varied and beautiful collection. Most books are singular but Kym also has many sets including the most expensive in the Collection - a rare set of encyclopedias from the 1600's. This set of 9 is $13,500. Of course, they range in price from $150 up - and interestingly the price is not determined by size, but by a variety of markers; including condition, content, outside embellishments, etc. The photos show just a small sampling of the Vellum Collection. Perhaps the most intriguing book to me is the one above. 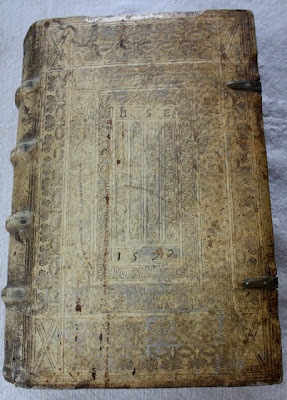 Stamped with the date of 1572, this book includes everything that is important to a collector. The book is a collection of the most celebrated passages of Euripides poetry. It has a gorgeous hand tooled cover, and beautiful writing on the ribbed bindings . Add to that the incredible hand forged metal latches, patina and outstanding condition. This is a very rare book and retails for $5,500. Here is another book with latches. This beauty is part of Kym's personal collection. She says it reminds her of her beautiful German Grain sacks. Notice the hand painted page edges in blue -Lovely! Now here is the exciting part!! Kym has offered this wonderful Antique Vellum book to a Willow Decor reader. This book is from 1626 in Venice, Italy. Can you even imagine the Villa it resided in so many years ago?? Written in Italian, the book becomes even more valuable, because of its wonderful condition and the the exquisite flourish on the binding. This antique book retails for over $600. Here is how to enter to win this antique treasure. Visit Kym Fraser's store, 3 Fine Grains, let me know what other items besides, these wonderful vellum books, that make your heart sing. Leave a comment back here at Willow Decor. For a second chance to win, be subscriber or follower of Willow Decor (you can sign up on the right column). Next Sunday I will announce the winner! Best of luck!! And a huge thank you to Kym Fraser of 3 Fine Grains for such a generous giveaway. Click here to go check out 3 Fine Grains and then come back and leave your comments. Good Luck!! Absolutely beautiful!! Love the crown ottoman, stunning. I really hope I win this book! I love all thing from Italy. DH and I spent our honey-moon there. Would be wonderful to have this book! Thanks! How lovely and generous! After visiting Kym's site...I must say that the throws look quite wonderful too! Thank you for sharing this opportunity and such interesting pieces of history with us! Love everything from 3 Fine Grains; the chairs are all fabulous and the pillows could spice up a variety of decors. It's so exciting that she now has these beautiful books. My fave at the 3 fine grains site, is the framed Weftheim 1872 Horse. Wow, what a stunning giveaway. I have been over to 3 fine grains and love the cushions and the framing of a sack. Thanks to you and kym for the opportunity for the giveaway. Beautiful Images!! I love your Blog!!! What an absolute treasure these vellum books are. Although we are in a time when information is readily sought on a computer screen, books can still offer so much. There is nothing like the feeling of holding a well loved book in your hands and they add immeasurably to a rooms level of decoration and comfort. As would the gorgeous throws and cushions from 3 Fine Grains. Like the vellum books these cushions and throws are a unique and exquisite piece of history. Apart from loving everything on her site - I love the little Vienne Antique Foot Stool (not that I would ever put my feet on it!) so gorgeous. And I love the books - I am a book lover - paper, typography, bindings - ah! happy sigh! What an amazing giveaway. Wonderfully beautiful!!! My favorite item from Kim's collection is the JK No. 26 framed sack. It's very special! Thank you for hosting such a lovely giveaway! I find the Johan chair a statement on its own, and also love the Alsace stork cushions.And of course, the vellum books. I also love her pillows! Great Giveaway! Thank you for the beautiful images of the books-- even the images would be a lovely addition to a library! After visiting Kym's site, I have to say my favorite is the French Postal pillows. They are simple, unique, and beautiful! What a beautiful give a way! Amazing history of all those books! I love the horse grain sacks...particularly the chair done in it! Well, if one were asking, it would be nice to have one from each category; because they are all wonderful. The Royalty chair would be nice to read abook in; with a cup of tea and a wonderful throw. Fun stuff...I love the no. 7 pillow...simple and to the point. Funny how now I NEED some of these books! Exciting give-away! I love the framed antique textiles. What a generous give away. Both sites are outstanding! 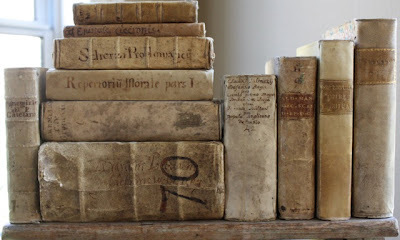 I have noticed these vellum books in other blogs, and being a lover of books wondered about them. Thanks for all the detailed info. Thanks for your informative post. 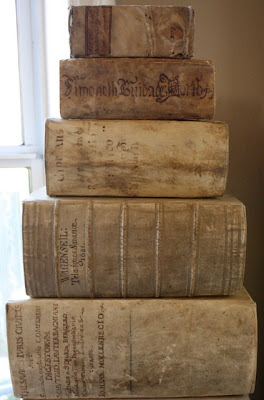 Being a lover of books, I had often wondered about vellum books when I saw them in other posts. Now I know more, and, thanks to you, even have a source! I have only seen pictures of these books but can only imagine their beauty in person. They truly are treasures. I have always loved the grain sack pillows at 3 Fine Grains. The beauty of these books and the grain sack textiles is that they give us a glimpse into an everyday world that doesn't exist anymore. Things once taken for granted are now rightfully recognized as art. Sacks that once provided for a family's income now hold places of honor in someone elses's home. Don't you think that the original owners of these would think us hilarious? But don't you wonder who patched a sack for reuse, and who loved those books so much? I sure do. I am a fan of the chairs. The Johan 1864 is wonderful. I've been an anonymous follower for some time, but this giveaway is causing me to become a public one! wow, the books are amazing! I also love the grain sack pillows. 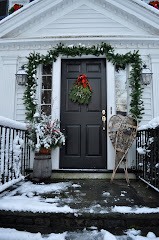 I love her antique grain sack pillows - so much so in fact that this winter when I found her site -- I made one of my very own -- using inspiration from 3 Fine Grains. This vellum book is just beautiful -- I think it would make a fitting companion placed somewhere near the grainsack pillow I made. Thank you for this opportunity!! I Love the grain sack wing chair and so many other treasures she has. I would LOVE to win the Italian book....I'm Italian!! Thank you , this posting was Beautiful!!! I also loved the framed antique textiles. Beautiful! Oh my, what doesn't make my heart sing that 3 Fine Grains carries! Just lovely items- the afghan throws are wonderful. I've really been wanting a pillow like the ones she has. My favorite is the Gotthilf Braun -- I love the dainty little ruffle around the edge!! Who would not love the Crown Ottoman...and the pillows...any and all! The books are so exquisite!!!! Little works of art and history. I would LOVE to own one! Kym's store is amazing too. I particulary liked the Weftheim 1872 Horse textile! I found the Johan 1864 chair particularly charming on Kym's site. Actually, there were a number of other items that I could add to my collection and happily live with. 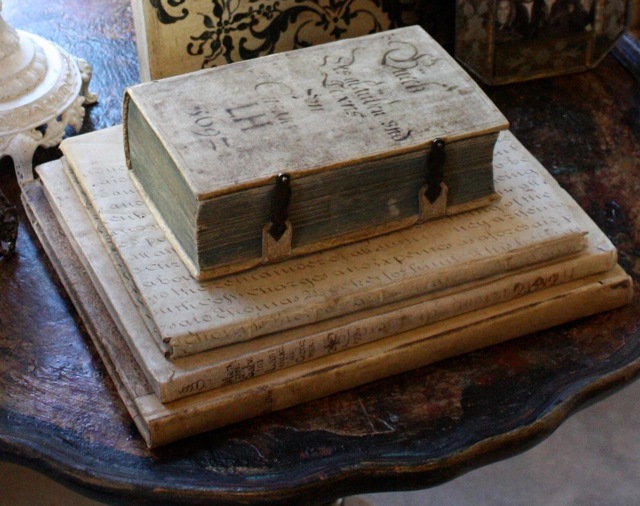 Beautiful books.. and I love her crown ottomans! so exciting...books are my weakness...I love the German grain sack pillows from 3 Fine Grains. Thanks so much for the chance to win...! The books are so beautiful - I love everything about old books, but my favorite is Old Book Smell... The throws at 3 Fine Grains are my favorite. Thanks for the giveaway! My favorite item from 3 Fine Grains is the fabulous Royalty Chair, a great wing back piece. Thank you for introducing me to Kymberley's online shop. Those books seriously have me drooling, they are divine! I adore 3 fine grains thanks to you introducing us awhile back. The textiles make me swoon and aside from the vellum books the pillows make me happy...love the Christgarten 1907 pillow and Number One. I am already a follower...thanks for the opportunity Gina! 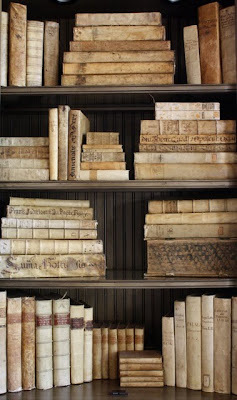 This vellum book collection is amazing. I was lucky enough to see these beauties in person a couple of weeks ago. I'm still hoping that my clients will purchase a few for their entry table. Kym and her husband are just wonderful. 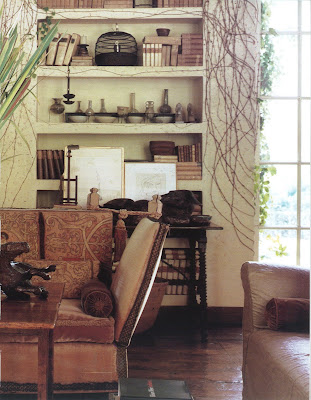 I think these books would look fantastic with any of Kym's furniture pieces, but I have been coveting the Bridle chair! What a great give away Gina! Oh, and I've been a subscriber for a while now. I love seeing one of your posts in my "in box"! Thanks for sharing this wonderful resource! I believe I'd like the wing chair, maybe a pair, for the Man Cave! The books are fabulous. I have subscribed to your blog for a long time, and it is always a pleasure. The stork and the rooster pillows are my favorite. The book is a wonderful giveaway. Oh Golly Gee! I want a collection of antique vellum books, but for now I will settle for one. I love the gorgeous "Bridle Chair." It would be "my chair"
oh my goodness, that book with the closures? be still my heart! on her website, i loved those chairs and those ottomans. what a great look. thanks for offering this giveaway, and thanks to kym. wow! just became a follower, too. Oh my, I have lusted after all the items on 3 Fine Grains many times. Note my continued love of the Royalty Chair! Wow! This is an incredible giveaway. These books would add such a warmth and history to any home. 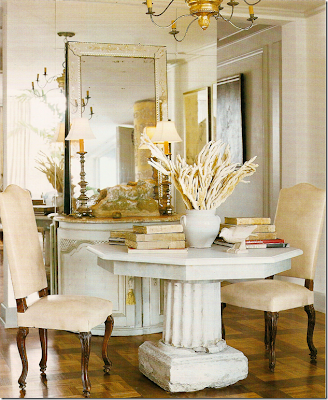 From the website, I love the framed Marseille Cowboy and every piece of the furniture. Just gorgeous. oh, wow! I love the German grainsack pillow and the framed German textiles. My ancestry is from Germany, so I'd love some of that in my house! I love the books!! As for my fave grain sack item, it's the stork from Alsace. He is awesome. I follow you on Google Reader. I love the Vienne Antique Foot Stool! I love the Belloy Ottoman! I had visited Kim's site before - and drooled! Everything she has makes my heart sing! The pillows, the framed sack, but the chairs - WOW! The Bridle and Royalty chairs are spectacular, and the Johan 1864 chair is amazing! Oh Gina!!! The vellum books make we weak in the knees. I visited 3 Grains after you mentioned it in the other post and by far, the books won my heart. However .... if I had to pick something else, it would be the French Chairs or the ruffled grain sack pillows. Have a wonderful day, and thanks to you both for such a fabulous GiveAway. Wow Gina! What an amazingly generous giveaway by Kym! Her whole site it wonderful, I couldn't possibly pick favorite- okay, maybe the Marseille Cowboy!! I love vellum books! Thanks to you and Kym! What a memorable gift that would be to win! Thanks to you and Kym for your offering. Both of you have delightful blogs that anyone would want to follow. It doesn't get any better than those gorgeous books but her throws are lovely too! Fabulous givaway, I love Vellum books. Wow! What a fabulous giveaway. I think my favorite from the 3 Fine Grains site is the bridle chair - it'd be fabulous in a reading corner! My heart is yodeling over the vienne foot stool. Would love to order that from her BUT the heart also pines over that book!! Thank you both! What a fabulous giveaway. These books are just exquisite. I love all the items at 3 Fine Grains, but my favorite would have the be the vellum books. Oh my! How to choose one favorite from 3 Fine Grains - impossible. But if I could only have one item it would be the precious antique footstool - a real conversation piece. The books are incredible - they inspire a reverence for books. I was just looking at this collection at 3 Fine Grains the other day! Oh how I would love some of the Latin texts! Thank you for such a generous giveaway. I'm a regular subscriber, and I always love seeing your posts pop up in my reader! What fabulous, fabulous books! I collect Victorian books for the beauty of their covers & spines, focusing on pale ones . 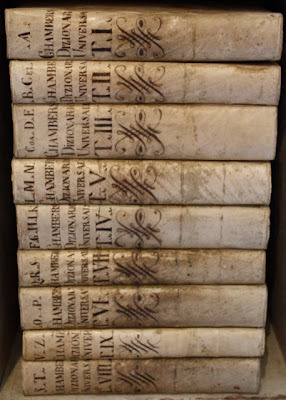 . . but none as old as those vellum beauties! That French Stork pillow would be perfect on my Dutch armchair upholstered in taupe raw silk! LOVE both of your blogs!! Love the German antique throws almost as much as the antique books!! Thanks for the post! What beautiful books! I also love the Weftheim 1872 horse and the Bridle chair. I love the crown ottoman and the German grain sack pillow. But my true love is these books. I have a very small collection of old books (some were passed down from my husband's great grandparents). And I have purchased a few but nothing as interesting as those you mention here. The books are so beautiful. I love everything from 3 fine grains, but today I want the French Stork pillow. Easy! I adore her grain sack pillows, especially the one with the stork on it! And I'm already a faithful follower of yours, would love this fab book! Wow! Beautiful books!! A lovely giveaway! What fabulous giveaway! The vellum books are so incredibly full of history. It would be an honor to own one. The crown ottoman is lovely, also. I know just the spot for it! I love everything at 3 Fine Grains! Honestly, those books are my first choice, but I have a place for an ottoman - the Belloy is my favorite. I visited her store and fell in love with the ottomans and the Johan 1864 chair. Everything is wonderful. Thanks for the chance to enter! grain sack pillows are beautiful! Oh my, count me in. I love everything on her site, which I have visited before. I love her pillows most. This book is so beautiful and would look lovely on my coffee table or on my empty book shelves in the guest room! It would set the tone. What an amazing giveaway! I found so many inspirational items at 3 Fine Grains but the one that is my favorite has to be the Bridle Chair. It really gets my creative juices flowing. I love the German grain sack, the calligraphy, and the nailhead detail. Apart from the Vellum books which are gorgeous, I absolutely love the Darned Patchwork Pillow at 3 Fine Grains. We are such a throwaway society and I admire the frugality and ingenuity of design from the everyday housewife of the past. I am a follower! wow, what an AMAZING giveaway--I adore the books. Please enter me for two chances, I am already a subscriber/follower of your blog which I always look forward to reading. The 3 grains website is so lovely--I am really partial to the throws! So chic! Everything at this site is just lovely but I have to say my favorite is the grain sack chairs, the text, the nail head details...all just amazing. What a fabulous collection of vellum books! I love old books. 3 Fine Grains has some wonderful products on their website. I love the throws, but I also really like the French Rooster Pillow Set. I loved the chairs. They make me feel like I'm in Europe! I have read your blog through Google Reader for quite a while and appreciate these amazing giveaways. I think her framed textiles are beautiful an, since I am a librarian, I would treasure any of those lovely vellum books! Ok I absolutely LOVE the vellum books! 3 Fine Grains website is awesome-I love the framed antique textile of the horse in grass (JK No. 26)! 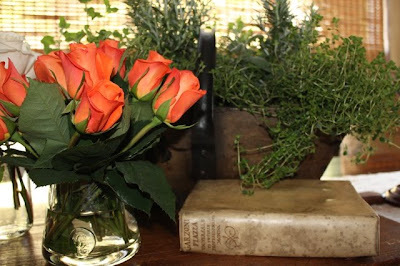 I love the books and the other item I liked was the Westheim horse as my house is from 1873 and it would be fun to have something from the same time period...I am a follower here and also read your posts over on gardenweb :-). Mmmmm, makes me want to go scour a used bookstore. Love the framed textiles and the 7 pillow! Love the Framed Antique Textiles they have. Such beautiful products. New to your site! We saw your home on Material Girls and it is just gorgeous. A home without books is a house without a soul. What a pair of lovely sites. I appreciate the work that goes into saving a piece of history, and a utilitarian one at that! My favorite pieces would be the 'Johan 1864 chair' and several of pillows- 'God Bless Agriculture and Breeding', 'Seamstress No.5', and 'Miller'. I also particularly like the framed piece 'Weftheim 1872 Horse', what a wonderful horse! Thank you! I didn't find the place in the right hand column to sign up as a subscriber, but I am! Wow! The books are so lovely, as are the ottomans and the pillows and really adore that foot stool too! Love this store! The God Bless Agriculture and Breeding pillow and the wing back chairs have been a favorite of mine for some time. What a great store! I'm lucky enough to own a grain sack dated 1848 that I bought in the late 1990s when we lived in Europe. At the time, I hadn't ever seen anything like it. It was love at first sight. I can't bring myself to cut it up, however, so I lust after many of 3 Fine Grain's products. If I had to choose one thing, I think it's the "Gotthilf Braun" pillow with its beautiful script. Your blog is one of my absolute favorites. Thanks for sharing. Beautiful prize aside - Kym's items are beautiful - thanks for once again sending me to an awesome sight. The Crown Ottoman over at 3finegrains.com makes my heart happy. What a great opportunity this is for someone to start a collection of their own! 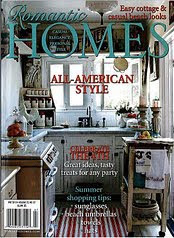 I have been in love with vellum books seen in fabulous design magazines and blogs. This beautiful book from Venice would be the perfect anniversary gift for my husband and myself. We were married in Venice on 4/16/91. How I would love to display this book along with our wedding picture. Thanks you for such a wonderful and generous giveaway. I got so excited about the book I forgot to mention my favorite item at 3 five grains. I love the 1862 pillow! I am also a follower. What is not to love ... .great site. I loved the grain sack pillow and the patchwork pillow ... also all the framed textiles. Aside from the wonderful giveaway, this was such a great post! I love just about everything on Kym's site. Esp the German Grain Sack pillow - so beautiful and unique! I love the German Grain sack pillows, particularly the Circa 1862 pillow. Beautiful! And what incredible books! Treasures! I would be honored to have any of the fabulous items on 3 Fine Grains in my home - with three little train-loving boys in my house I think I would win major points if I bought the Friesland Train pillow - it would be a win win for all of us! (now lets see if I can convince the finance committe - my husband- of that!) Great giveaway! oh it is impossible to choose just one, but I am especially crazy about the Vienne Antique Foot Stoo1! I can see it in my art room! Would love to win, love love getting your emails! All the items at Kym's site are beautiful. The books offered is gorgeous. I especially loved the 1926 Plow throw. It would look wonderful on my white leather sofa. Thanks to Kym for making this wonderful offer! The Marseille Cowboy is pretty great, but really, everything in that shop is awesome. What a great prize? Love everything on their website. Have been enjoying the pillows and furniture made with the grain textiles but this was the first time I have seen the throws. I think those are really fun. 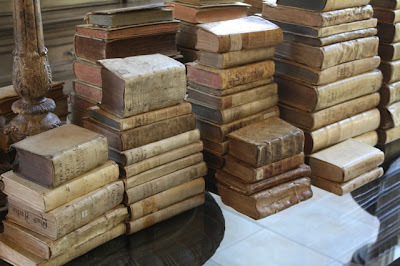 Also, I have collected antique leather books for years and we sell a lot of them as well. Have just recently been noticing the beautiful vellum books and I love them. I am glad to learn more about them and can now appreciate the price a little better. I have been following your blog for a while now too and really enjoy it. Thanks for doing this. I'm passionate about books and am completely enchanted by this offer. If I had to pick, I'd definitely go for the crown ottoman. Thanks again. WOW. I mean, wow. This is amazing! I love love love old treasures like this! 3 Grains has an amazing collection - I think my fave is the Belloy ottoman. Awesome giveaway! I've seen these books in person and they are an amazing sight to behold. Thank you so much for such a great post about both the books and the very talented Kym Fraser. The book is lovely- what an amazing giveaway!! Love that little No.1 pillow with the ruffle along with the wing chairs, and oh so many more things at her store! The bridle chair makes my heart stop! Love this giveaway! Please put my name in the hat. Love your blog too. I absolutely love the look of these books. I have always kept my eyes peeled for loved older books that I could use in my decor, but I have never seen any as lovely as these. I think I would die if I actually won one! Her entire site is breathtaking! If I could be the lucky winner, I would assure you the book would be placed in a prominent spot in my home! The crown ottoman is awesome...actually everything is! I love old books. The oldest I currently have is from 1852. Wow these are so beautiful. I just started watching the Tudors on showtime and it takes place in the mid 1500's. It is amazing to think that those books have lasted 500 years! It's older than any books I have. My other choice would be French Postal Sack (B). Wow what a fabulous giveaway...hope I am lucky with this one!!! especially the '1897' one with the darn, I like things to not always be perfect, they are more like us then, showing some wear but still lovely ha ha. The stool is so clever and useful somewhere to rest a while, or snug myself into a cosy printed chair...to read with a comfy throw I can't choose but they are fabulous. Gina, wonderful Gina, this is hands down one of the best giveaways in blog land - like ever! (This and Brook's coffee table that you also had a part in). I love antique books and have 2 gray book shelves in our dining room filled with them. I have not started to collect Vellum books yet - but maybe this will kick start my collection. Add my name to the hat! Hi Gina, Wow. This is an amazing giveaway. Thank you so much for the opportunity. Well, let's see. . . I love just about everything at 3 Fine Grains. My favorite, I think, it the Darn Patchwork Pillow. Just wondering where all those little pieces came from and who worked so hard at repairing the holes. I would LOVE this beautiful book, of course, and am a ardent follower of Willow Decor already. Have a beautiful day! This is an amazing giveaway! I simply LOVE LOVE LOVE the German Grain Sack pillows and would love to have a set for my condo! The book would look great on my antique desk! Years ago, an antique vellum Bible disappeared from our storage facility during a protracted move to a new construction home. Many heirlooms disappeared at the same time. I don't dwell on that loss, but seeing these fabulous photos reminded me. I want to stroke the photographs! This is a great topic for your blog; thank you for thinking of it. I like the pillows, but the books are the best! In addition to the amazing books she has on her site, I am totally in love with the pillows. A home can never have too many pillows, especially ones that are so unique. The most fabulous and generous giveaway I have seen! The item that makes my heart sing is the crown ottoman. Fa il mio cuore cantare! The book is fabulous and I am super triple crossing my fingers!!! P.S. I am also a follower so please enter me twice!!! i love the framed textiles - especially the grain sack with the horse. but everything in the shop i gorgeous! Wow, what an amazing giveaway!! I am in love with a lot of items offered in the 3 Fine Grains store, but I really, really love the Sanders Foot Stool. I think the books are totally amazing!! I love them!!! I really like the chairs... but I love the books! I'm loving "Johan 1864". Thanks for this opportunity to win! Yay! I am a follower!!!! Thanks for the opportunity to enter such an exciting giveaway!! I have to say the pillows are my particular favourites especially the storks. Although it is hard to choose from such treasures. I surprisingly love the Grain Sack pillows. They are just fab. Oh, how lovely! I was in love with everything at 3 Grains...the throws were so different and beautiful, very hard to choose from! The vellum books are gorgeous! 3 Fine Grains is so fortunate to have this wonderfull Vellum book collection, now available to all. Love them!!! Amazing...simply amazing. As a lover of antique books, I am in awe of this collection. And the pillows are incredible too. But the books...ah...a person can dream of curling up with one of these...thanks for all the inspiration in your blogs! We are mere keepers, they outlive us! What an exquisite giveaway!! Thank you so much! 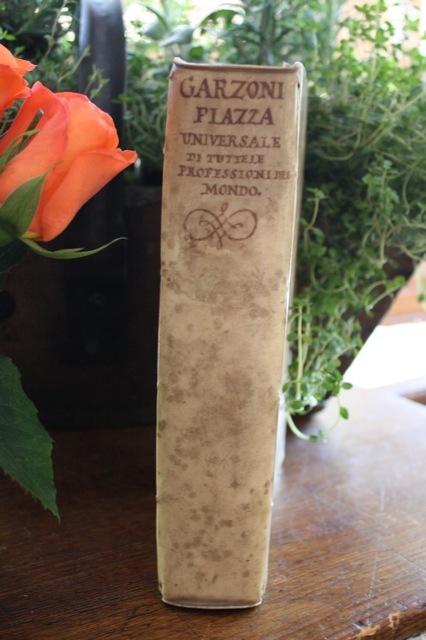 It's hard to imagine owning such a treasure as an antique Venitian book. 3 Fine Grains is an amazing place and I'm in love with the beautiful Gottlieb Soldier textile. Is this too good to be true? That Royalty chair looks inviting. Throw in an ottoman and we've got a winner. By the way, I am obsessed with your blog. What an awesome collection of books. They are gorgeous. I love the framed sacks, cushions and the ottomans. Fingers crossed! I have drooled over 3 Fine Grains for a while now. The simple Postal Sack pillows are a fave of mine. Thank you so much for the chance to win such an awesome giveaway. What a wonderful giveaway! Loved looking at everything on Three Fine Grains site, but my absolute favorites are the Weftheim 1872 Horse Textile and the French Stork pillow! Thank you both! I love the vellum books! Everything on her site is wonderful, but the books are my favorites. I love everything at 3 fine Grains, but if I had to pick one it would be the Bridle Chair...I could sit close by and stare at that chair for hours!LOL I am soooooooooo excited about the lovely vellum book giveaway. Thank you both for such a fabulous giveaway! I have also been following your beautiful blog for some time now. Love it! Hmmmmm. I should have mentioned. The vellum books are my favorite; the Bridle chair my second favorite, over at 3 Fine Grains. I still want to stroke the photos. Hard to pick a favorite from 3 Fine Grains - but if I must it would have to be the circa 1880 throw - wow! I have been a follower for a while, I have several items on my wish list, which seems to get longer each time I visit. The wing chair is at the top of my list, with a cozy throw for my chaise. I would love to have the book for my coffee table to compliment the scene. I have been a fan of 3 Grains for a while, the wing chair is at the top of my wish list with the throw for my chaise. The vellum book would just be the right touch for the room. I would love to win this book. Melissa Lewis of Redo Home and Desigin in Franklin, TN. The antique Vellum books are fabulous. I really have a "thing" for books but never owned a Vellum book. They really make a statement in a room. I love all of the items on the 3 Fine Grains website. So many wonderful items--a feast for the eyes! Thank you both for such a wonderful distraction in the day! I love the A H 1879 hanging sacks. I like that they are hanging items - not just framed. They feel more euro cottage that way. The Crown Ottoman is also gorgeous! This is an amazing giveaway! I will be keeping my fingers crossed all weekend to win this prize! Thanks! Love everything at 3 Fine Grains, especially that wonderful Johan chair. Thanks for such a fabulous give-away! I love 3 Fine Grains and would love to own a pillow from their collection! Specifically: Chrisgarten 1907. 3FG is so great-- it's too hard to pick just one favorite!!! GREAT giveaway so thanks! Lord have mercy. These are the most beautiful books I have ever seen in my life. Everything over at Kym's makes my heart sing -- everything! If I had to pick one thing that made my heart sing a little bit more, it would be the German Grain Sacks. I'd have ALL of them, if it were possible. Thank you for the chance and thanks to both you and to Kym for such a generous and breathtaking giveaway. Oh I forgot I am also a follower of YOU! I have followed Kym Fraser for a while. I love all her antiquities. I think the throws are really wonderful! Hard to believe books could be better than they already are, but vellum books, oohh. I love the stork pillow, but then the storks in the Alsace are so gorgeous. The framed antique textiles are so cool. But really I would love everything they have!!! Gina this is an out-of-the-world give-away opportunity! How incredibly generous. Kym's site is wonderful and there are many things I love, however throw no 12 may perhaps be my pick at this point. I am a subscriber, but just now became a follower - I am trembling in excitement and hope my name appears in the hat too. I love the vellum books the best, but also love the rounded grain sack stool. I can't even imagine holding a book that was written so many centuries ago. What a treasure. Love the 3 Grains work. The pillows are beautiful. The vellum books are very interesting. I just adore the vintage grain sack pillows! Thanks for the great giveaway. Everything on the site is great, but I especially love the vellum books also the Johan 1864 chair. It is hard to beat the books, but I think I also love the little Vienne Antique Foot Stool. I can see myself curled up looking through my book with me feet on this stool...lovely! p.s. I am now subscribed to your web site as well. I love the 3 Grains items. They work so well in many different designs. And books! Oh my gosh. I love books, I love the smell, the feel, everything about them. Thanks for bringing them to us. The vellum books are incredible. I'd love to be looking at the books while sitting in the Bridle Chair with one of the 3 Fine Grains throws...of course I'd need the stork pillow also. Thank you for allowing me to dream. The books are calling me. I love these. One can never have too many books. I also am captivated by the pillows, especially the darned grain sack pillows. They are just so "darned" humble and so very personal. Sort of like teddy bears for adults. I want one (or more)! In a time when information is readily sought via a computer, books can still offer so much. There is no feeling like holding a well loved book in your hands. Books add immeasurably to a homes decor and level of comfort, as would the gorgeous cushions and throws from 3 Fine Grains. These and the vellum books are a unique and exquisite reminder of the past. 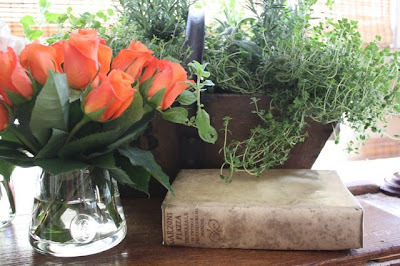 A Home for the Vellum Book & New Giveaway! Exciting News!! & A Thank you!!! Araucana Blue Inspiration & A Big Surprise! !